Mike Gibbons from Richmond Virginia with his big doormat! He has been coming to Snug Harbor Resort for over 40 years and is one of the longest running customers. We hope you keep coming for another 40! 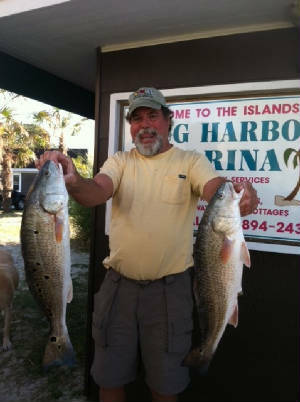 Big Bob Nickel with two nice red drum he caught off the beach. He has been coming to Snug Harbor for many years! Alex Kuper with this incredible flattie she caught off Chincoteague island, look what happens Steve Kuper when you take a woman fishing! You bring back dinner! 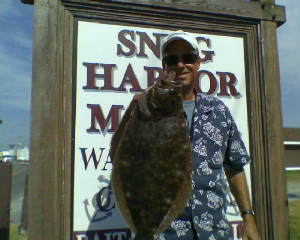 Chuck Ambrose with his giant flounder he caught drifting by Snug Harbor. He has a Ravens shirt on but really he's a die hard Redskin fan. Go Skins! 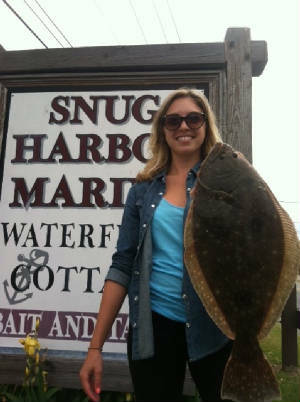 Great catch of flatties right by the dock at Snug Harbor. 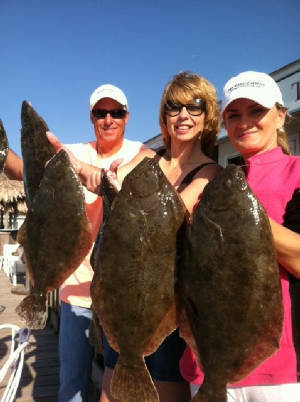 This is one of the best flounder seasons in the past 10 years. You have to know where to fish and what bait and the crew at Snug Harbor can put you on the big ones! Mr. Dean Zirkle is holding this incredible flattie he caught drifting by Snug Harbor. He has been renting boats from Snug Harbor for many years and is one of our VIP customers, he always knows where the big ones are! 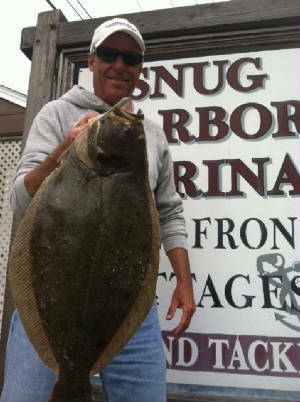 This is Chuck Ambrose one of the best fishermen from the Baltimore area with a giant flounder he caught close to Snug Harbor. 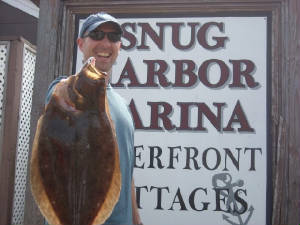 This is Mr. Jason Barschdorf with his 4.5 lb flounder he caught by the Assateague Lighthouse. 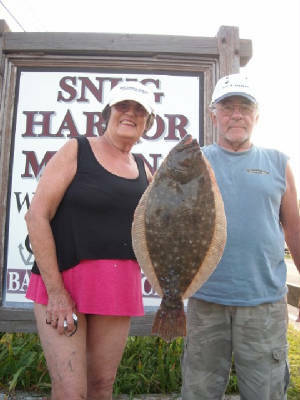 This is Mr.& Mrs. Brown with one of the biggest flounders ever caught along Assateague.Look at this doormat! He was using Snug Harbor bait! 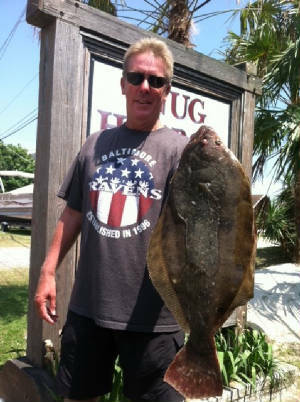 Chincoteague Island has been a great hot spot for flounder fishing this past spring. 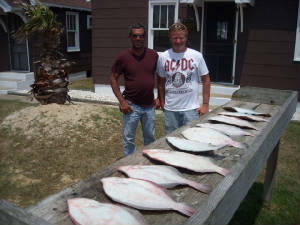 Most of the fishermen were reporting large catches of flounder with a lot of throw backs, many of the fishermen have stated that they haven't seen fishing like this for many years. Most boats were catching 15-20 flounder per day with 1-3 keepers.The hot spot for the big flatties was up the Assateague Channel between the lighthouse and Tom's Cove campground. This is world renowned flounder fisherman Mike Gibbons from Richmond Va. 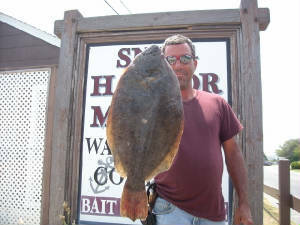 He hit the flounder hard last spring and has caught many good size flounder just like this 4 lb flattie he caught drifting down the Assateague Channel close to the Assateague lighthouse. I wonder if he can do it again this spring ? Mike loves fishing right after sunrise with the tide full. Mr. Mike Gibbons says the best bait to use are big bull Snug Harbor minnows.....just ask for the big ones! 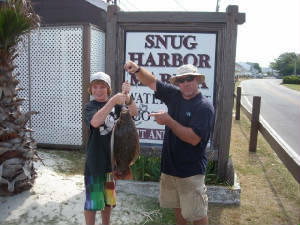 This is Mr. Campbell with little Max with a large catch of flatties that they pulled from the Assateague Channel. This is Mike Worley with this incredible catch he caught by the Assateague Lighthouse. 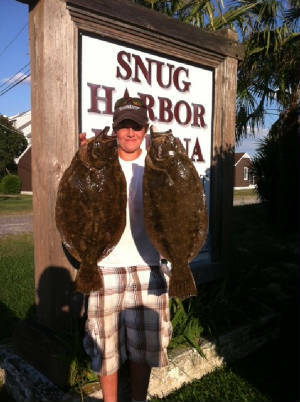 The is the best up and coming fisherman around, Josh Mandelblatt with two nice flounders caught close to Snug Harbor on Chincoteague island. 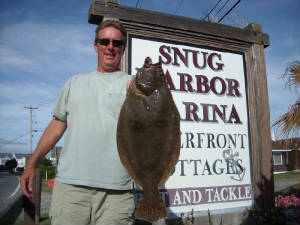 Snug Harbor is the hot spot for the big ones! 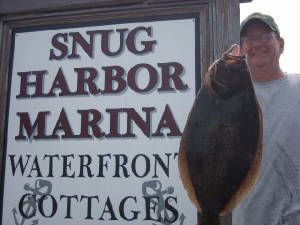 Don't forget the best bait to flounder fish with is big bull Snug Harbor minners!